I have just finished reading Geraldine Brooks' "People of the Book" for my bookclub. Thoroughly enjoyed it. She based the book on the true story about a Jewish holy book saved by a Muslim Librarian in the Serbian War during the 1990s. 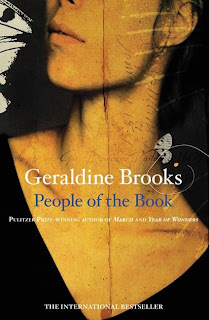 I have enjoyed all the books by Brooks I have read, she takes an historical event and makes a good tale, she wrote one about the plague that was fabulous. The main character in "People of the Book" is a book conservator and when she talked how books and paints were made in the past it reminded me of another fabulous book I have recently read by Victoria Finlay "Colour - travels through the paintbox" which is all about how colours for paints were made all through history.This is the most interest non-fiction book I have ever read, absolutely facsinating. I am also reading Colour by Victoria Finlay and am finding it so interesting. thanks for visiting my blog and adding comments. I have enjoyed looking at your blog and website. the book looks interesting i will have to follow this up.